Social customer service is the wave of the future. In just a few years, customers have gone from begrudgingly waiting on phone lines, hoping to finally hear the sound of a human voice, to simply posting questions and expecting to be answered within minutes. Technology has raised the bar in terms of customer expectations. With everything moving faster, you have to be on the ball with regards to your communication strategy, branding, and customer interactions. In addition, you are no longer competing exclusively with brands in your industry. Instead, you’re competing with every other company your customers have ever dealt with. As a result, brands have had to take their social media interactions to the next level. Now that social media has become the platform of choice for customer-brand communications, it’s time for every brand to up their techniques in order to create the optimum experience for each and every customer. When your customer takes the time to drop a comment on social media—whether it’s a complaint, praise, a question, or something else entirely—they’re looking for instant gratification and resolution. They want an answer, an explanation, or some type of acknowledgement from you almost instantaneously. After all, in their mind, you are there to meet their needs. So if there is a lapse in time, it seems as if you have other priorities. 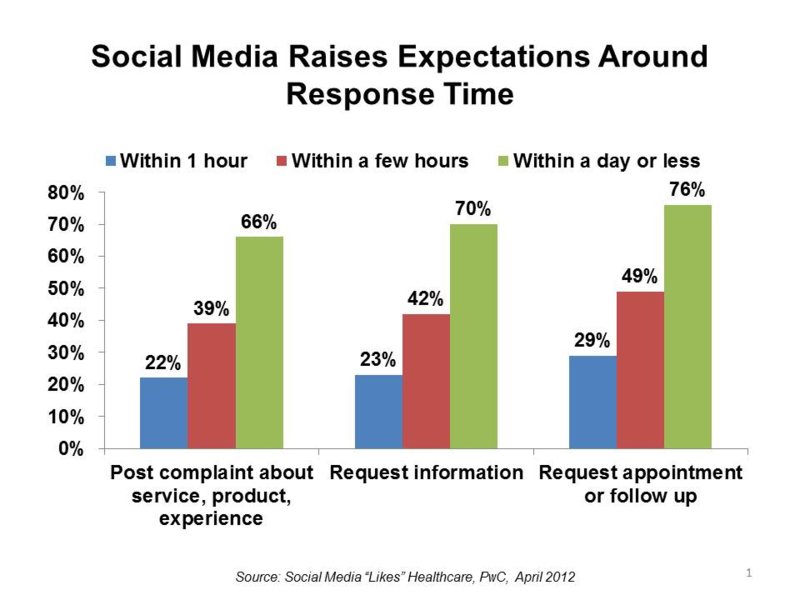 In fact, 72 percent of customers who complain on Twitter expect a response within an hour, and 53 percent believe waiting time should be even less. Even for complex solutions, your initial response time must be speedy. Because Facebook messenger now shows response time, your customers will automatically know exactly how long it took you to get back to them. The faster it is, the more impressed they will be. Make sure to address the issue quickly and convey that you are working to find the best solution for their situation. You are on Facebook, Twitter, Instagram, and Snapchat, but are all these channels optimized for customer service, or are they used purely as a vehicle for marketing content? Today’s customers are looking to build relationships with brands through social accounts. Therefore, it can’t be all about you—it has to be about them as well. Dedicate some time to develop a social media strategy which addresses and fuels your customers’ needs in all relevant social channels. This way, you become a true #socialfirst brand, making your customers feel valued and important. Not all social media tools are created equal, especially when it comes to optimizing it for customer service. 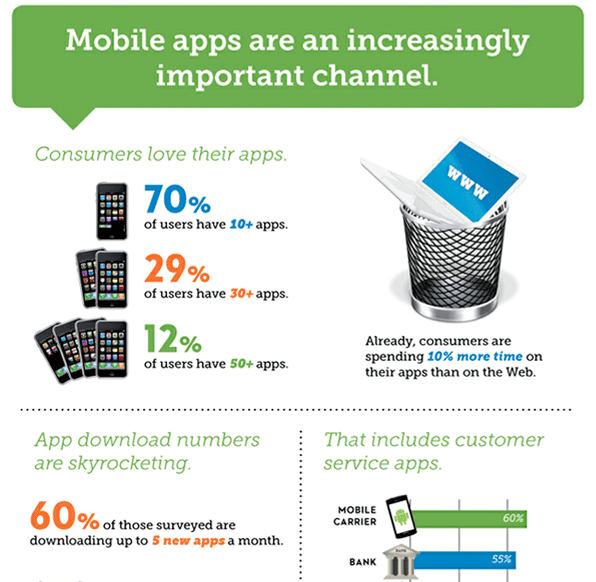 Customers today want to reach you on channels that are convenient for them. That means your customer service should be available over any social platform where they are already present. It’s therefore important that whatever platform you use has the capabilities for mobile communication and Facebook Messenger. This way, customers are able to reach you in a manner that feels natural and easy for them. According to YPulse, 75 percent of purchases will be on mobile by 2020. This means your customer service platform must be easy to access through mobile in order to stay ahead of the game. In addition, more and more companies are getting in on the Facebook Messenger action. This gives companies the capability to discuss personal issues in a manner that is both convenient and private, allowing both the brand and customer to win. At the end of the day, people are looking for human interaction. That’s why they prefer to work with companies that show personality over brands that seem robotic and automated. This is especially true on social media. Since social channels are made for casual interactions, brands that are able to communicate in a natural tone generally win the seal of approval. However, it’s important to match your customer’s tone. If your customer is addressing you in a more formalized manner, it’s always better to answer formally in order to boost credibility. It’s important to extend this strategy both on and off social media. Just as your communication on social should generally be more relatable (i.e. writing how people actually speak), your website and other marketing materials should reflect this human tone in order to keep it personal. Removing your customers from their preferred channel to solve an issue is both inconvenient and inefficient. People don’t want to add unnecessary extra steps to solve their problems. Instead, they want you to meet them the whole way, putting the full responsibility on your end. If you are discussing an issue on Facebook, keep it on Facebook. In fact, using Facebook messenger has helped brands like Hyatt connect with their customers in a manner that is extremely convenient for everyone. Since Messenger is a personal channel meant for one-on-one communication, it can be optimized for personal resolution as opposed to public venting. Customers appreciate this sentiment, and as a result, continue to remain loyal to the hotel chain. Social is no longer a vehicle exclusively for your marketing department. In fact, your social interactions will be more well-rounded and effective if you get your entire team on board with a distinct social media plan. This way, you present yourself as a unified voice, giving the entire company the opportunity to familiarize themselves with your customers’ needs. This integration is essential. Through it, you make sure your products and services actually meet your customer’s standards while also keeping the overall customer experience top-notch. Keep in mind that your CEO is not excluded from this effort. In fact, your CEO active on personal social accounts can make a huge difference in showing the human side your company and solidifying your branding. 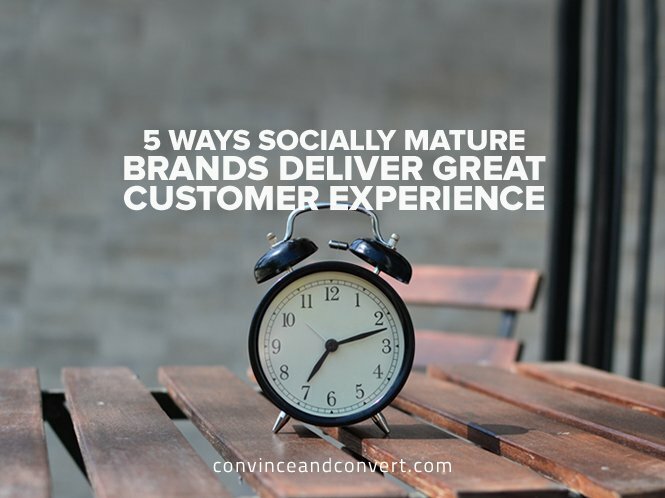 Maturing your social media strategy is a great way to improve customer experience. By following the tips above, you go the extra mile to make sure that your company listens and respects your customer’s needs, establishing you as a credible and genuine company that people want to work with again and again. Tamar Frumkin is the Brand/Content Marketing Manager at Conversocial, a cloud-based social media customer service solution. Her experience spans fashion tech, ad tech and B2B SaaS with a focus on strategy, content and branding.